This ravishing portrait can be dated on the basis of its elaborate costume to around 1610, when Lady Mary Neville was twenty-six years old. It was a pivotal time in British portraiture, which was reaching a decorative crescendo with magnificent costume pieces by courtly artists such as Marcus Gheeraerts and William Larkin. Here, the richly ornamented fabrics in Mary’s attire amply reflect her wealth and status as the daughter of Thomas Sackville, 1st Earl of Dorset and Lord Treasurer of England, and the wife of Henry Neville, 9th Lord Bergavenny. Our portrait is one of a number of fabulous costume pieces associated with the sitter’s family. It was only three years later that Mary’s nephew, the 3rd Earl of Dorset, was famously painted in resplendent full-length by William Larkin, 1613 (Kenwood House, London), and that her own daughter Cecilia Neville, was painted full-length in silver and blue by Robert Peake, on the occasion of her marriage in 1617 (Private collection, UK, previously with The Weiss Gallery, 2000). Private collection, UK, till December 2018. Mary’s expensive fur-lined mantle is embroidered with costly silver thread and ‘spangles’ (sequins), possibly caduceus forms – snakes coiled around rods, emblematic of eloquence and a love of literature. Silver was particularly fashionable, as shown by the following description of Lady Anne Russell’s wedding in 1600, where eight ladies dancing in a masque ‘wore a skirt of cloth silver…’, and ‘a rich waistcoat wrought with silks and gold and silver…’ Mary’s fashionable Jacobean accessories include an open high-backed ruff, a complex lace head-dress, and she holds an ivory inlaid fan. From her ears dangle carnelian hoops on black threads, and her bracelet is made of large alternating coral and agate beads, thought to be amuletic. Perhaps most significantly of all, she holds a sprig of honeysuckle, signifying both love and devotion, as well as quite literally a blossoming, for Mary’s hand is tucked under her richly embroidered outer robe, and placed carefully across her stomach, presumably an allusion to a pregnancy. She sits in a chair against a backdrop of matching red curtains. Although the inclusion of chairs in Jacobean portraits was a common painterly conceit at the time, more often sitters were painted standing beside the chair, rather than sitting on it. Again, we can speculate that Lady Mary is sitting due to a possible pregnancy. Her pose and the style of the painting owe much to the iconography of Marcus Gheeraerts the Younger, who at the time was one of the most fashionable portrait painters of his day. 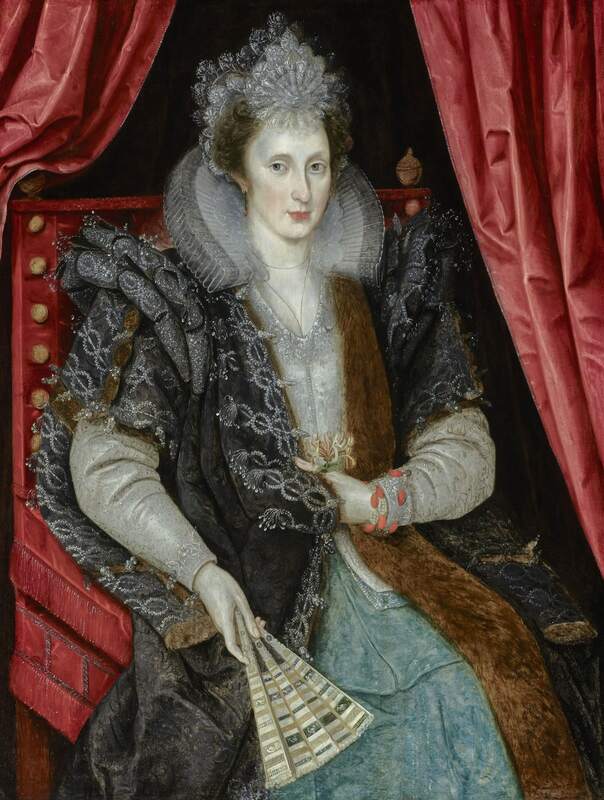 Under the powerful patronage of Sir Henry Lee from c. 1590 onwards, it was not long before the artist had come to the attention of Elizabeth I, and then later, as favourite painter of the new queen, Anne of Denmark. He continued to paint within courtly circles until c. 1620, when the likes of Daniel Mijtens and Paul van Somer were in the ascendant. It is in the context of her father’s great political power that Lady Mary Sackville was married to Henry Neville, 9th Lord Bergavenny (c.1570 – 1641), around 1600 – 1601, when she was still a teenager, and with whom she went on to have five children before her death in c.1613. Her husband had served at the Capture of Cadiz under the 2nd Earl of Essex in 1596, and in 1597 was licensed to travel abroad for two years with Thomas Sackville, Mary’s brother. Mary’s father (then Lord Buckhurst, later Earl of Dorset), owned several iron foundries with Neville, and had a patent which gave them monopoly in the production of ordnance weaponry. The families were evidently much involved, business ultimately leading to marriage. In 1601, around the time of Mary’s marriage to Neville, he was elected M.P. for Kent, and in 1604 was M.P for Lewes. Lady Mary Sackville was the daughter of Thomas Sackville, 1st Earl of Dorset (1536 – 1608) and Cecily Baker (1535 – 1615), (the daughter of Sir John Baker, MP and Speaker of the House of Commons). Her father, the 1st Earl of Dorset, had risen through the ranks to great power under Elizabeth I, and in 1599 he succeeded William Cecil, Lord Burghley, as Lord Treasurer, a position he kept until his death. In 1601 as High Steward he pronounced the death sentence on the 2nd Earl of Essex, who until that point had been his greatest rival and political opponent. James I confirmed Sackville in his office of Lord Treasurer, and in 1604 he was created the Earl of Dorset. J. Nichols, The Progresses and Public Processions of Queen Elizabeth, 1823, vol.3, p. 498.